In recent years political sociologists have constantly bewailed what they regard as the subject’s fragmentation and lack of focus. There has appeared little agreement about the topics to be covered or what constitutes the intellectual framework of the discipline. 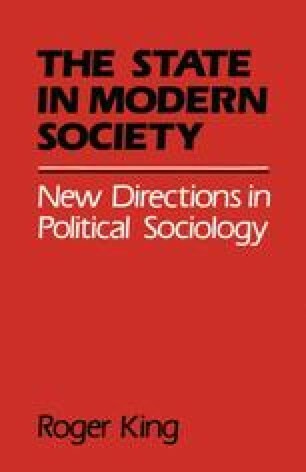 In large part this reflects the disintegration in the 1970s of the dominant orthodoxy that governed political sociology in the 1950s and 1960s, which we label ‘the sociology of democracy’, and the search by some for another all-embracing paradigm. But it also reflects a more persisting aspect of political sociology, the compounding of dissensus on scope and methods to be found in both sociology and political science. In Britain, for example, political sociology has generally possessed a schizophrenic institutional location, in some cases being taught within sociology departments and in others within political science departments (Dowse and Hughes, 1972, p. 2). This appears to make a difference to what is taught. Courses provided by political science departments are much more likely to pay attention to individual political behaviour, covering such topics as voting, participation, attitudes, socialisation and formal models of political systems and institutions, than those provided by sociology departments which tend to indicate an interest in large-scale socio-political change, the state and ideology.